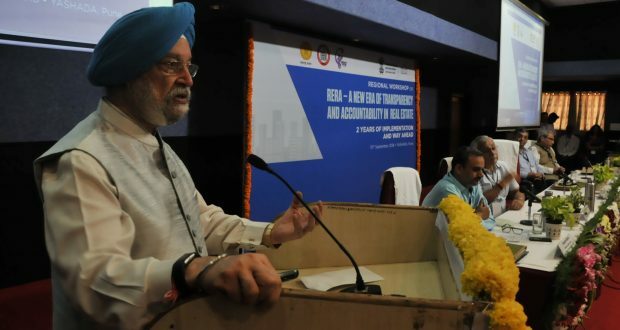 Pune:10/9/18:The Union Minister of State(I/C) for Housing and Urban Affairs, Shri Hardeep Singh Puri has said that the Union government is committed to provide positive solution to the problems of home buyers, so that they get their home as soon as possible. He was delivering the inaugural address at the “First Regional Workshop on RERA – a New Era of Transparency and Accountability in Real Estate – Two years of implementation and way forward (Western Region)” inPune today. During his address, the Minister pointed out that the country had no regulator for the real estate sector for nearly 70 years after it gained independence, and said that the year 2016 will reveal that year to be a seminal one as that was the year when the Real Estate (Regulation and Development) Act, 2016 was enacted by the government under the leadership of Hon’ble Prime Minister Shri NarendraModi. Various stakeholders associated with the Real Estate Sector i.e. Developers, Home Buyers, Financial Institutions along with the Chairpersons and senior officers of Authorities, Tribunals and State Government officials from the western part of India attended the workshop. Addressing the participants, the minister stated that the year 2016 changed the real estate sector forever and defined the dawn of the post RERA era. RERA is characterized by trust, rules, regulations and regulatory oversight as opposed to the pre-2016 period which essentially was one of mistrust, fraud, cheating and broken promises, he said and asserted that “the plight of the homebuyers who were at the mercy of the developers and bringing discipline in the Real Estate Sector was one of the core objectives of this landmark legislation”. “Had RERA been in place, say, 20 or even 10 years ago, consumers would not have had to knock on the doors of the judiciary, as the stringent provisions of RERA would have ensured an eco-system that would have prevented the entry of ‘fly by night’ operators, he further said and added that, “we now have a Government that believes in bold and radical reforms”. Which is determined to bring about a change in the lives of the honest tax payer. “We will and are urging, encouraging and persuading the States to set up the regulatory apparatus envisioned under RERA, speedily”, he further said.